Leopold changed how wildlife is managed by changing the practice from single species focus to ecosystem focus. He maintained that we must look at the whole natural community. For centuries people only focused on one species at time and did not consider the impact of narrow focus in regards to environmental health. Following his publication, scientists and the general public began looking at how the ecosystems function and how our lives and economy are impacted by our practices. Rachel Carson brought it to public attention that DDT and other chemicals were not only harming wildlife and destroying biodiversity but were harming humans. There will always be those that do not care if negative impacts affect families if they can make more money for themselves. When it became apparent that the sleeping aid Thalidomide caused children to be born with stubs for legs and arms, the medicine was outlawed. More testing was required on drugs while some people do not think public protection merits laws to protect people or wildlife. There is always a struggle between self-interest and public interest. There are efforts to persuade public opinion away from public interest so that individuals can do more activities without considering their impacts on the general public and health of the environment that supports us. As Earth Day approaches (April 22) there is controversial legislation in Michigan (Senate Bill 78) that will prevent wildlife biologists from considering biodiversity in management practices if passed. SB 78 redefines “biological conservation” and restricts the ability of the Department of Natural Resources to consider “biodiversity” when managing state lands. — Prohibit the DNR and the Natural Resources Commission from enforcing a rule that designates an area of land specifically for the purpose of achieving or maintaining biological diversity. — Delete the conservation of biological diversity from the DNR’s duties to balance its management activities with economic values. — Eliminate a requirement that the DNR manage forests in a manner that promotes restoration. — Provide that a State department or agency would not have to designate or classify an area of land specifically for the purpose of achieving or maintaining biological diversity. — Revise the definition of “conservation” with regard to biological diversity. 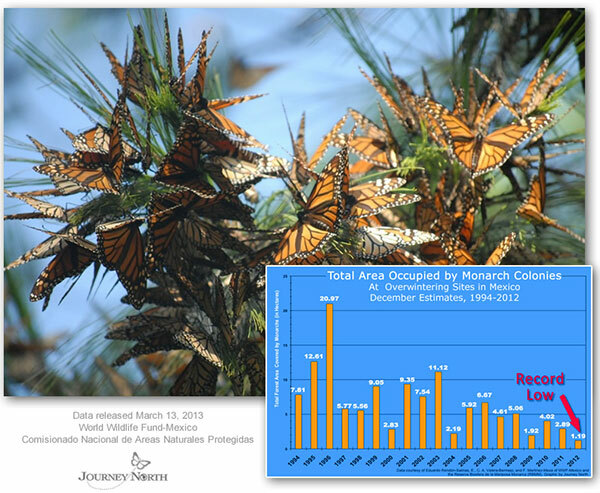 — Delete a legislative finding that most losses of biological diversity are the result of human activity. Perhaps the best thing you can do for our community this Earth Day is read the bill and contact your legislators with your thoughts. David Marin, of Nelson Township, has been waiting a long time to get this photo. 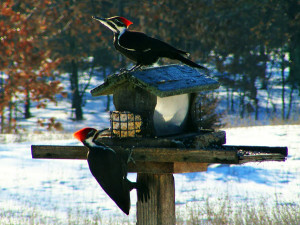 He finally got his chance last Thursday, March 14, at 9:45 a.m.
“On rare occasions, the notoriously camera-shy and nervous pileated woodpeckers come to the suet at my feeders,” explained Marin. “This morning, I was able to capture a photo of both male and female at the same time, something I’ve been hoping and trying to get an opportunity to do for decades.” Marin lives about three miles east of Cedar Springs. According to Ranger Steve Mueller, although the birds look similar, you can definitely tell one is male and one is female. “The male (lower bird) has red on forehead to bill and the female does not (her red stays on top of her head). The male has a red mustache (dark strip from base of bill) and the female has a black mustache,” he said. Frank Rackett collected and mounted birds starting in 1876 and continued through about 1936. He donated his collection to Godwin Height Public Schools. The school district could not properly care for the collection and was no longer displaying them. They contacted the Howard Christensen Nature Center (HCNC) to see if they would be a useful addition to our extensive display collection. More than 150 bird cases containing about 450 birds were picked up in March 2012. During the summer and fall, volunteer Dave Cartwright refurbished cases and cleaned specimens. Preparing the collection for display has taken hours and great dedication from Dave. Without his efforts, the current display would not be suitable for viewing, enjoyment and education. Come to HCNC between 9 a.m. and 4 p.m. on weekdays or noon and 4 p.m. on weekends to enjoy the displays. Taxidermist Harold Moody donated live mount specimens (those prepared to look like living animals) to HCNC starting in the 1970’s and continued for 30 years. When a bird or mammal was killed, we contacted Harold and he volunteered to mount specimens in memory of his daughter, Pamela, who was killed at age 24 by a drunk driver. We also worked with MI DNR conservation officers to acquire animals that were confiscated from poachers or were found dead like the Common Loon that swallowed a fishing lure. The Mute Swan flew into a power line. The bobcat was hit on Red Pine Drive north of the nature center. The Rackett collection contains many birds from western North America, including a few from south of the United States. There are several warblers and rarities like the Green Jay, MotMot, Painted Redstart, Lewis’s Woodpecker, and Mountain Plover that one will not see in Michigan or may not be found in other Michigan collections. We developed what might be the most extensive bird and mammal collection for any nature center in Michigan. Universities and some large public museums have more but it is rare to find such an extensive collection at any nature center in the nation or world. Our collection is especially rich in birds of prey and I doubt it is matched by other nature centers. HCNC is now a 501c3 non-profit operated by Lily’s Frog Pad and is working to continue serving school districts and area communities. HCNC is an important community resource and deserves community support. To help HCNC continues its mission, you can sponsor a display case or live mount display by providing funding for operations. Explore the displays free during open hours and please sponsor a display for a year. Come pick a display of your choice and provide $25 or more in support for 2013 programming to serve education and community interests. When visiting ask about individual or family memberships. Though I am retired, I continue to volunteer at HCNC where more volunteers are encouraged and welcomed. Contact Cindy Perski at 616-675-3158 to offer your skills from technology, grant writing, woodworking, outdoor projects, nature study surveys and more. http://lilysfrogpad.com/volunteer-opportunities/. Natural history questions or topic suggestions can be directed to Ranger Steve (Mueller) at the odybrook@chartermi.net Ody Brook, 13010 Northland Dr, Cedar Springs, MI 49319-8433, 616-696-1753. The 2011 Christmas Bird Count for the Grand Rapids Audobon Club took place on December 31, 2011, at 2 Mile Rd NE and Honey Creek Avenue in Kent County. 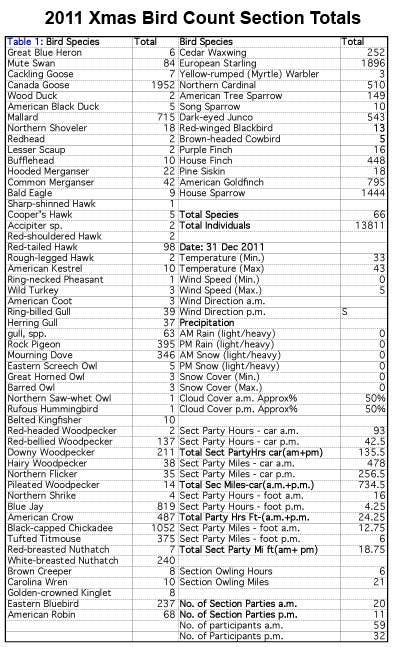 62 participants observed 66 species of birds on count day. There were 59 counters in the morning and 32 in the afternoon. Four species of owls were recorded and that is up from zero last year. No additional bird species were added during count week. Table 1 lists the birds sighted for the count circle. Total individuals sighted were 13811. A significant sighting was a Rufous Hummingbird. I received a call regarding the hummer presence while I was in Minnesota for family Christmas. I referred the call. Allen Chartier came and banded the bird before count day so we knew we had it for count week. Fortunately several of us were able to see it on count day. Mark your calendars now for the December 29, 2012 count. For more info, contact Ranger Steve at odybrook@chartermi.net or 616-696-1753. “Ranger Steve” Mueller, of Cedar Springs, was recently named Outstanding Senior Interpreter, by the National Association of Interpreters. He was selected from among professional members in 34 countries. The award was presented at the National Association for Interpretation Conference in Minneapolis, Minnesota, on November 12, 2011. The career of “Ranger Steve” Mueller has crossed over six different decades. Since his start in the 1960s as a Michigan State Parks Ranger, Steve has served in National Park Service (NPS), as a high school and college biology instructor, and as chief naturalist at three different nature centers. He has been recognized by NAI, National Park Service, Michigan Department of Natural Resources, and Michigan Audubon Society. 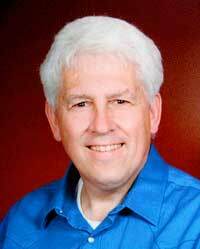 Steve has authored over 100 articles related to nature and interpretation through Michigan Audubon and local newspapers. Retirement has not slowed Steve down. He continues to write his “Ranger Steve’s Nature Niche” newspaper column for the Cedar Springs Post. In addition, he regularly leads programs and organizes workshops on wildflowers, outdoor photography, butterflies, and native landscaping. Steve lends his many years of experience in land conservancy related to the endangered Karner blue butterfly, and leads butterfly counts in Michigan and Bryce Canyon National Park. “Over many decades and well into retirement “Ranger Steve,” in many diverse capacities and through his myriad talents, has consistently demonstrated his passion for our profession,” said Ray Novotny, of the National Association for Interpretation. Ranger Steve is a life member for the Lepidopterists’ Society and is conducting a biodiversity study of the butterflies and moths at Bryce Canyon National Park, in association with Colorado Plateau Museum of Arthropod Biodiversity, where he is a research associate. He discovered a new species of virgin tiger moth in 2005. He maintains a Michigan Audubon Society teaching collection of birds and mammals permitted through the US Fish and Wildlife Service and Michigan Department of Natural Resources, that are displayed at Howard Christensen Nature Center, Wittenbach/Wege Agri-science and Environmental Education Center, and are used in teaching Ornithology for Grand Rapids Community College. In March, The NAI awared Mueller the 2010 Distinguished Interpreter award, he highest award they bestow. We have been getting reports of robin sightings this week. Does that mean spring is around the corner? This picture was taken on the lawn of Martin Haack on Shaner Ave. just north of 15 Mile Rd. “Marty wanted some pictures of this big guy to prove that Spring is on the way!” said photographer Ron Parker. Ranger Steve Mueller told the Post last year that some robins actually never leave during the winter, but live in area swamplands over the winter. We asked him this week if we can tell which ones stay and which ones leave. He said, no, but one can tell when they are beginning to move. “People start seeing them in places they have not been seeing them,” he explained. He noted that the ones here in the winter probably are from further north, and the ones from here shift to the south.